#OHL Playoffs Preview: @OHLBarrieColts vs @OHLBulls meet in Round 1. - Very Barrie Colts | A website covering the Barrie Colts of the OHL. Home Barrie Colts Belleville Bulls blog BMC CHL Eastern Conference Game OHL Playoffs preview #OHL Playoffs Preview: @OHLBarrieColts vs @OHLBulls meet in Round 1. 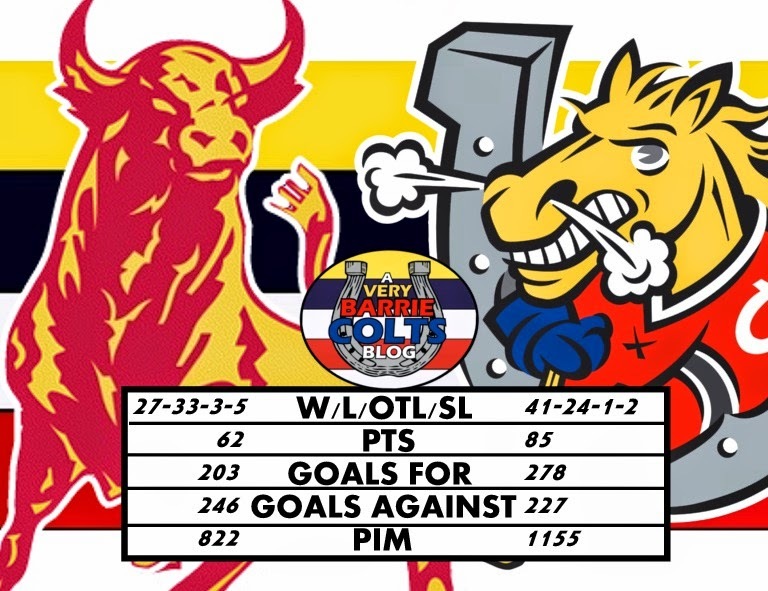 #OHL Playoffs Preview: @OHLBarrieColts vs @OHLBulls meet in Round 1. First round of the playoffs will see the Barrie Colts(2) face the Belleville Bulls(7). The Colts and Bulls only met 2 times this season with the Colts winning both games. In those games, Barrie outscored Belleville 15-4. The Colts went 9 for 16 on the power play compared to the Bulls and Barrie also out shot them 73 to 52. The Colts had 3 players with more than 100 points on the year. 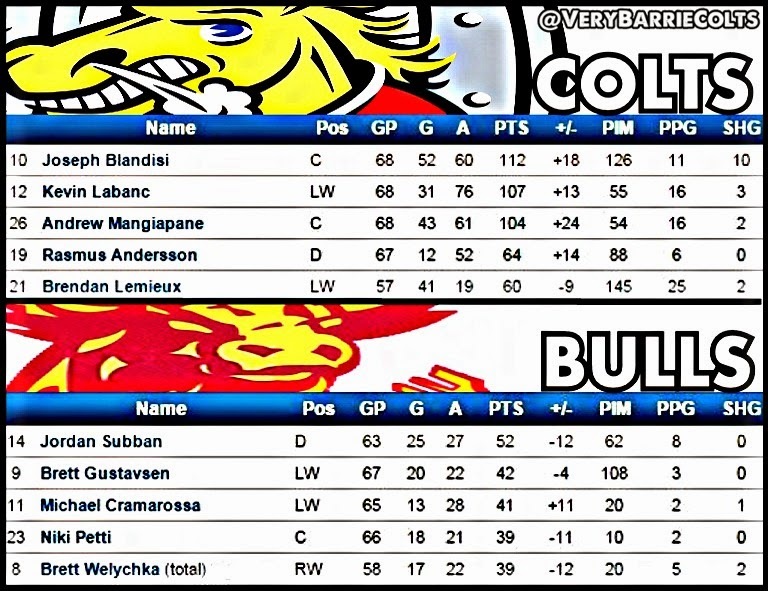 Here is a comparison of Barrie's top 5 point scorers compared to Belleville's top 5. Play disciplined but be aggressive. The Colts played strong games in both meeting this season and the Bulls found themselves to be the ones in penalty trouble. If Barrie can be the more skilled team (which, they are) then they can use that to draw calls. Using speed in the offensive zone, generating shots and keeping your feet moving is how you achieve this. Going 9-16 against the Bulls on the PP is huge and if they can get the Bulls trailing early in the series, there is no reason they can't make it to the second round quickly. They will need to be smart and they will need to stay out of the box. Remember, this is the playoffs and though we could easily paint a picture of how the Colts will go 4-0, it doesn't always work that way. Belleville is a strong team and they will not go down with out a fight. Plus, in the teams final season I would look for them to try and make a solid run.